Animals ride a bus through town. 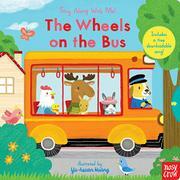 The wheels on the bus go round and round in this interactive board book. The familiar children's song is brought to life with a variety of sliding panels that turn the wheels, swish the wipers, and bounce babies. The bus's passengers are anthropomorphic animals, illustrated with soft lines and a calm color palette. The panels are decently constructed and should stand up to all but the roughest handling. Another title in the Sing Along With Me! series, Old MacDonald Had a Farm, publishes simultaneously, bringing that other beloved children's song to life in a similar artistic fashion, with the same sort of panel interaction. These songs have long proven their worth with little readers, and tots won't hesitate to embrace these cool interactive versions of them. Each book is printed with a QR code that enables readers to download the titular song.